Contemporary mountain retreat with breathtaking views of Mount Millicent. 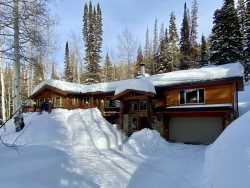 Nestled in a pine and aspen grove – this home offers privacy and the convenience of being just steps from the Milly Express lift. This spacious home has 30’ floor to ceiling windows in a large open living and dining area, five bedrooms with three en-suite bathrooms, a television and game room as well as numerous amenities including hot tub, sauna, wraparound deck, gas grill, audio system, 2 washers/dryers and wifi. In-floor radiant heat throughout. Sleds, games and puzzles are available for guest use. A caretaker resides on premise in separate studio.